Premenstrual Syndrome (PMS) refers to the combination of physical, psychological, and behavioral disturbances that are experienced by women of a reproductive age after the last week of their ovulation. PMS usually ends with the onset of a woman’s menstrual flow. There are many factors that can cause PMS. According to Rapkin (1997), health specialists speculate that the fluctuation of the levels of hormones such as estrogen and progesterone might have something to do with the symptoms. The majority of women experience mild symptoms of PMS and can continue their day-to day-activities. However, Wittchen H-U et al. (2002) says that up to 2 to 5 percent of women experience such severe symptoms that their daily living is disrupted and they are forced to seek medical attention. This condition is referred to as Premenstrual Dysphoric Disorder (PMDD). 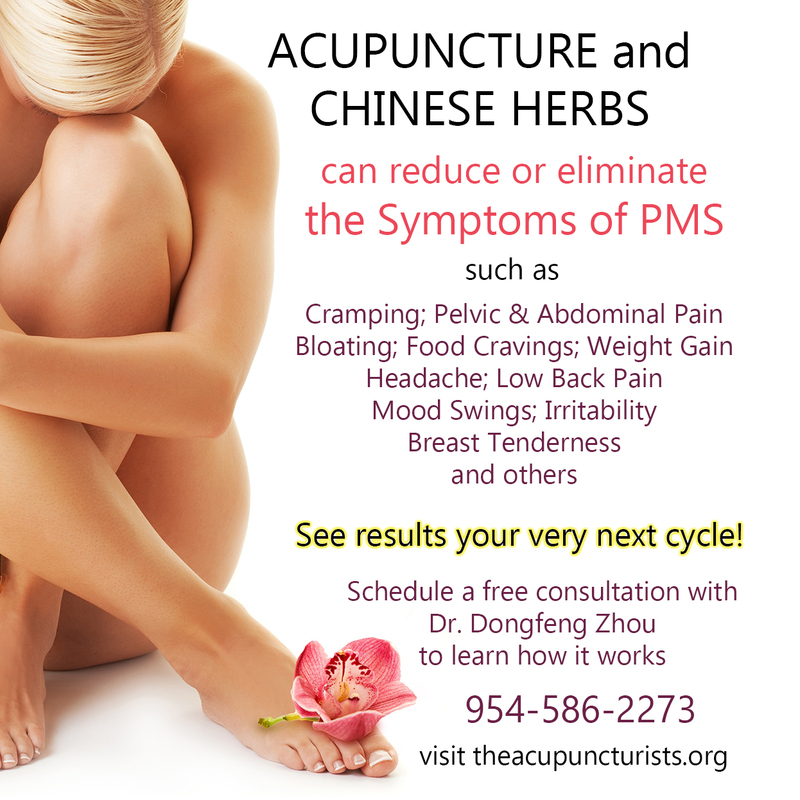 Fortunately, acupuncture and Chinese herbal medicine have been proven to effectively reduce the symptoms of PMS and PMDD. Acupuncture treatments along with the proper herbal formula can provide results within the very first cycle of treatment. Let’s delve a little more into the possible causes, symptoms and conventional treatments of PMS before we talk more on how well acupuncture works. About 80 – 85 percent of women experience premenstrual symptoms at some point in their lives. According to Freeman (2001), the diagnosis of PMS is made due to the presence of at least five of 17 symptoms associated with the condition. One displays digestive symptoms such as constipation, indigestion, or a craving for a particular food. The person may also exhibit emotional symptoms such as mood swings, depression, irritability, anger, and insomnia. Physical symptoms include weight gain, headache, bloating, cramping, breast tenderness, and pelvic pain. In some cases, the woman may display symptoms like acne, colds, and palpitation. All these symptoms contribute to an overall feeling of discomfort. Perhaps a more severe effect of premenstrual syndrome is the loss of a woman’s fertility as a result of the hormonal fluctuations and the stress the body goes through during menstruation. Additionally, PMS can result in a blockage of blood flow to the reproductive organs hence preventing conception. Further, the fluctuation in hormone production may result in the lack of ovulation or poor egg quality. These symptoms ultimately interfere with a woman’s ability to conceive. Western medical approaches for the treatment of premenstrual syndrome target the symptoms. However, some treatments are only able to alleviate certain symptoms. This means that the patient is required to use different treatments to address the symptoms she is experiencing. Some common treatments of PMS include the use of anti-inflammatory drugs to address bowel symptoms, headaches, cramping and pain in the breasts. For patients who experience irritability, depression, and anxiety, common medications include anti-depressant drugs. The use of contraceptives is a common approach to preventing PMS as they reduce hormonal fluctuation caused by ovulation. Women suffering from PMS may also use synthetic progestin, although sometimes the chemical worsens the situation by inhibiting the production of natural progesterone. The use of supplements such as vitamin E and essential fatty acids can help alleviate the symptoms of PMS. Vitamin E is particularly effective in relieving breast pain, insomnia and nervousness. If the patient is experiencing nervous tension, or they are using contraceptives, they are advised to use vitamin B complex. These vitamins are essential in helping the women who have PMS function before and during PMS. Another helpful supplement in alleviating symptoms of PMS is vitamin B-6. Studies show that magnesium is also a helpful supplement for patients with PMS. By swallowing two pills of these supplements every day for about six months, you can significantly reduce the symptoms of PMS. Kwan (2009) posits that other drugs such as buspirone, metolazone, and valprazolam may be used to alleviate the main physical and psychological symptoms of PMS. When other gynecological problems accompany PMS, surgery may be recommended. The Chinese Medicine approach to the treatment for PMS does not see the condition as unrelated to the overall health of the woman. Rather, the symptoms are seen as relating to the entire body. Therefore, by undergoing acupuncture, a woman not only gets relief from PMS but also enjoys a much improved physical and emotional health. As a result of her revitalized overall health, her fertility is increased, and she can thus conceive much more easily. As a method of treatment, acupuncture revolves around the theory that “Qi” (life energy) is continuously flowing via energy pathways throughout the body. According to Steiner et al (2001), when a person goes through stress, whether physical, emotional, or psychological, this flow stagnates. Acupuncture is geared towards restoring the free flow of “Qi” so that the person is well again. Acupuncture views PMS as “Liver Qi” stagnation. In other words, the person with PMS has a stagnation of Qi in her liver meridian system. This congestion results in stress, which then causes irritability. The woman experiences breast distention and PMS. The flow of Qi thus needs to be restored for her to feel better. Sometimes, PMS is caused by stagnation of life energies resulting from the flow of blood, the weakness of the spleen, and the health of the heart. By directly removing the blockage in the concerned body part, acupuncture steadies hormonal imbalances. The result is a calmer mind and a relaxed body. Acupuncture targets the ‘roots’ of stress and relieves them. Therefore, the person experiences physical, emotional and psychological harmony. Symptoms of PMS such as irritability, anxiety, headaches, cramps and breast pain are alleviated. There is extensive research to back the effectiveness of acupuncture as a method of treatment for premenstrual syndrome. A research carried out by scholars from the School of Acupuncture-Moxibustion and Tuina (Beijing University of Chinese Medicine) came up with the findings that acupuncture is an effective means of treatment for premenstrual syndrome. Another corroborating study was published in the Archives of Gynecology in 2002. According to the findings of the study, 77.8 percent of women under observation were successfully treated – meaning a reduction of PMS symptoms – after going through acupuncture. For over two thousand years, acupuncture has been an effective means of treating many conditions including the symptoms of PMS. Besides the fact that it delivers results within a short time, women are attracted to it for its other benefits. First, as the practice is natural, it does not require the patient to take drugs, which may result in side effects. Secondly, the woman’s general physical, emotional and psychological health is improved. While research is still ongoing to establish what exactly causes PMS, one thing remains sure; when it comes to the treatment of this cyclic disturbance, acupuncture is one of the most reliable alternatives. 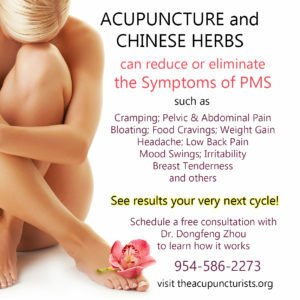 At our wellness clinic serving the Coral Springs, Coconut Creek, Margate area, Dr. Dongfeng Zhou specializes in the treatment of PMS using acupuncture, nutritional guidance and traditional Chinese herbal preparations. Consultations are free and she’ll be happy to sit with you and explain exactly how her treatment works and what you should expect from treatment. Stop suffering with PMS. We accept most insurances and discount package prices also available. Give us a call today! Freeman E, Rickels K, Yonkers K, et al (2001). Venlafaxine in the treatment of premenstrual dysphoric disorder. Obstet Gynecol, 98, 737–44. Kwan I & Onwude L (1992). Premenstrual syndrome. Clinical Evidence. Managing the premenstrual syndrome. DTB, 30, 69-72. Rapkin A, Morgan M, Goldman L, et al (1997). Progesterone metabolite allopregnanolone in women with premenstrual syndrome. Obstet Gynecol, 90, 709–14. Steiner M, Romano S, Babcock S, et al (2001). The efficacy of fluoxetine in improving physical symptoms associated with premenstrual dysphoric disorder. Br J Obstet Gynaecol, 108, 462–8. Wittchen H-U et al. (2002); Prevalence, incidence and stability of premenstrual dysphoric disorder in the community. Psych Med 32, 119-32.